Us Guys urge you visitors to surf our friends' webpages rather than wasting time looking at this nonplace holder. FYI: if you're looking for Little Prague Bohemian Restaurant, we're sorry to let you know it closed. 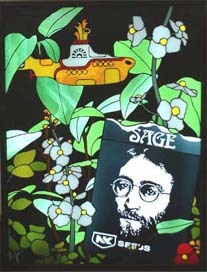 internationally recognized stained glass restorationist & artist. He commissioned us (his friends) to construct it for his business, but, as you will see, it was virtually completed when he suddenly passed away. click pic for piece's details. "It Must have been a Beautiful Garden"
from a Net Nervous Nerd. __________________________in radio and/or television broadcasting. Members come from all aspects of the industry, on or off mic. If you were there when it went on air, read on! Our nonprofit org helps the Park and provides college scholarships to Native American students. If Indigenous Culture, Native American arts & crafts, and/or the Western Trading Tradition are of interest to you--visit us! How about reading a good pageturner--a fun whodunit? 3rd-in-a-series of light & lively mystery adventures. The first, Murder Off Mike, is a prize winner, literally! Drive to Hubbell Trading Post like Ken in a gullwinged wonder. Go Back to the Future via his DeLorean club. Or.... Take your time; slow down; get closer to nature. Ride a bike! annual Party Pardee tour de farce! Speaking of jokes, just who is this Montgomery and why does he have to pack his computers into mothballs? It's not like they're fabricated from Navajo Sheeps' wool. Shouldn't those machines be up in the attic with the rest of the don't-need-it can't-let-go-of-it stuff? Learn the secrets of retro techno when floppies were a hard 8" and harddrives a sorry 100 megs. Visit Ken's cyber museum--or don't. Our house pest, Opice Monkey, has discovered Music Matt and can't stop listening to his jaunty tunes. this guy is a 3 to 10 year old's rock god. 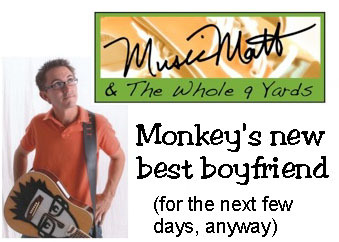 Monkey adds, "Not to mention his band is the Whole 9 Yards!" We're not biased. Our neighbor's Thai restaurant just happens to be the best! Voted Sacto's "Best Thai Restaurant" year after year in poll after poll. Click him to visit him. This site is best viewed at 1024 x 768 on a large, energy efficient monitor with a browser not controled by MicroSoft, e.g. FireFox, or Opera.